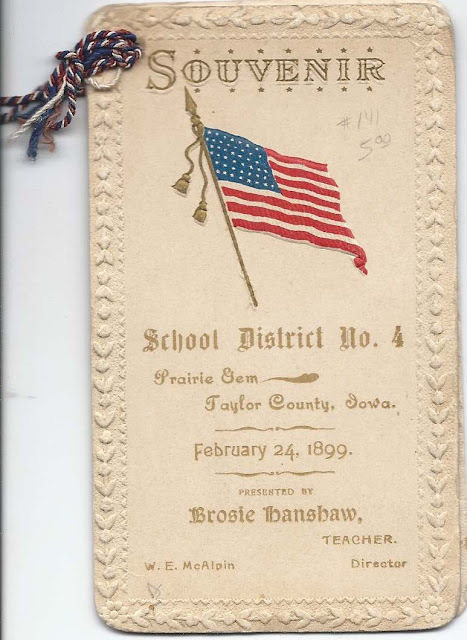 Souvenir of School District No. 4, Prairie Gem, Taylor County, Iowa, February 24, 1899. Presented by Brosie Hanshaw, Teacher. W. E. McAlpin, Director. I think that teacher Brosie Hanshaw was George Ambrose Hanshaw, born 15 March 1878 at Platteville, Iowa, the son of James Smith Hanshaw and wife Elizabeth Ann (Simes or Simms) Hanshaw. His paternal grandparents were Smith Hanshaw or Hancher and Mary (Stewart) Hanshaw. His maternal grandparents were James Harry Simes and Rebecca W. (Johnston) Simes. George Ambrose Hanshaw, hopefully our "Brosie", had a younger sister Rebecca Maud Hanshaw. 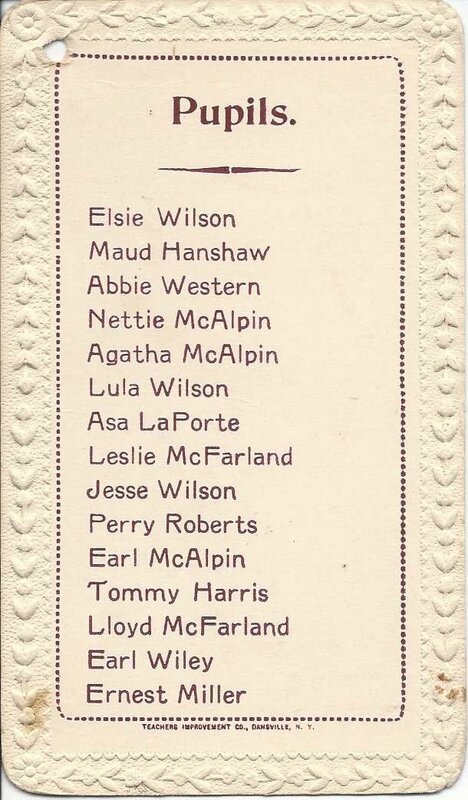 Note that one of the students listed is Maud Hanshaw. On 24 December 1903 at New Market, Iowa, George Ambrose Hanshaw married Sadie Berniece Peterson, daughter of Peter (or Peto) and Anna (Mangel) Peterson. Sadly, Sadie died as a result of childbirth in 1907. The child, a son, Claude DeVoe Hanshaw, died not long after his birth. On 20 June 1909 at New Market, Iowa, George Ambrose Hanshaw married Elma Edith Marsell. She was born about 1884 in Iowa, daughter of John Joseph Marsell and Sarah Jane (Henry) Marsell, born in Vermont and Iowa, respectively. The director, W. E. McAlpin, shown on the cover, was William Eugene McAlpin. 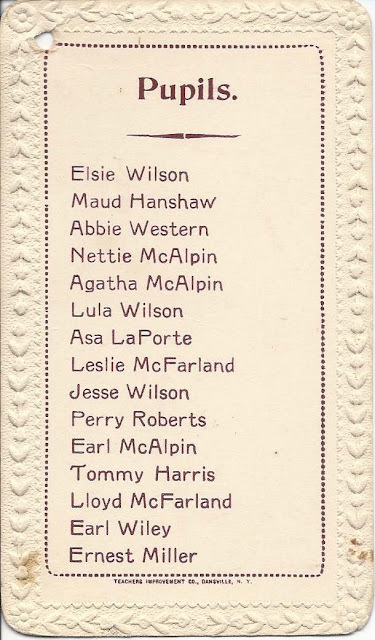 He and wife Amanda (Weaver) McAlpin were the parents of three of the students listed: Nettie McAlpin, Agatha McAlpin and Earl McAlpin. If you have any corrections to the information above or any insights into the lives of any of the pupils listed, please leave a comment or contact me directly.